Volker Gerling collects flipbooks like some people collect acquaintances. “I’m curious about people; about souls,” he said on the phone from his home in Germany. Gerling started taking photos as a child with his super eight film camera, and dreamed of becoming a film director. It was at film school in 1997 that the flipbook seed was first planted. He saw a documentary about people in a retirement home, and one scene grabbed his attention. He remembers one lady showing a flipbook of herself from the 1920s — the flipbook of herself as a young woman flipped in her old hand and she came to life. “This scene is the reason I had the idea to do flipbooks,” explained Gerling. This is not Gerling’s first visit to the PuSh Festival (he brought the same show in 2011), but he has had a few years to collect more moving portraits, and his stage show is always evolving. During his 10 days in Vancouver in 2011 he managed to collect two new flipbooks, and those will be included in this new incarnation of the show. 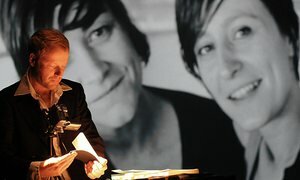 On stage, Gerling can be seen flipping the books while holding them under a camera projected onto a large screen. Along with the mini movies, he shares the stories of each subject. There is also a microphone to amplify the sound of the book flipping, which evokes the sound of an old-fashioned film reel. At the end of the show the audience is invited on stage to look at the flipbooks and try flipping them themselves. When Gerling first started experimenting with the flipbook form, he found it interesting to see what happened when people didn’t know he was doing a flipbook — they would think he’s taking one photo instead of many photos in succession. “It’s a moment of truth and reveals part of your character,” said Gerling. This uninhibited moment of truth is perhaps why, as Gerling explained, “many audience members are touched in a deep way. They don’t expect what they feel, they’re not sure what to expect, and most of them have never seen flipbooks before.” Some have even been brought to tears. It’s a new way of seeing as people are brought to life thorough these moving portraits. During that walking exhibition he couldn’t do new portraits or create new flipbooks because, as he said, “You really need intimate encounters to photograph people.” The next year he walked farther, from Berlin to Basel, Switzerland. On that walk he had more time to meet people and find good candidates for new flipbooks. While he has now amassed a significant collection of flipbook portraits, Gerling has plans to increase his collection of flipbook places. But, he admits, “It’s not so easy to find places that are really special.” He has a vision of creating a sort of time lapse video style flipbook of a full 24 hours showing the shadows of trees moving in relation to the sun and the moon.